Unfortunately, it’s not always possible to travel as much as you’d want. Maybe you have to prepare for exams. Or your boss isn’t as lenient as you would have liked. Maybe you just broke your leg. Maybe it’s a cash flow problem. Maybe your schedule isn’t aligning with your travel buddy. Or maybe it’s raining too much. Have no fear! Books allow us to far and wide without ever leaving our living rooms – or bedrooms, or balconies, or favourite bookstore/cafe hangout 😉 At Pagdandi, it makes us smile when we see people enjoying the faraway experience of a book. We’re proud to bring faraway worlds to Baner. It’s our belief that through books, you can travel wherever you want. It’s the first place that pops up in most of our minds, when we talk about an easy, fun holiday. Goa is a paradise for everyone – for those looking for relaxation, those looking for adventure, and those looking for a party. India’s smallest state, it is a hub for international and domestic tourism. Its dominant mix of Portuguese and Konkani heritage still allows for people from all over the world to make a new home. With the arrival of winter, it’s a perfect time to do some research, save some cash, and pack your bags. A psychologically revealing, flash-back-filled first person account of a small time wheeler dealer’s transformational ideological crusade, taking him from the “Wild East” corruption of 90s Russia, via the illusory psychedelic liberation of Goa’s tropical beach paradise — viewed through the prism of a narrator stranded in the farcical existential vacuum of awaiting justice from Indian legal system. This is a collection of essays, poems, stories and extracts from works that bring to life both the natural beauty and the changing social and political ethos of India’s smallest state, Goa. From Nisha Da Cunha’s insidious, evocative tale of a tradition where the women never leave the house and don’t know unhappiness because they had nothing to contrast it against to Mario Cabral e Sa’s resurrection of the first Portuguese women to come to Goa; from John Huygen van Linschoten’s account of a sixteenth century murder, which he thought would be “good to set it downe in large, that hereby men may better perceyve the boldnesse and [filthie] lecherous minds of the Indian women” to Sonia Faleiro’s portrait of a man, Outkast D’Souza who is acutely sensitive to sound, smell, colour, and touch, but is unable to comprehend reality, the book weaves together a cascade of narratives about people who have walked these shores. An ensemble of historical writing, reflections, stories, poems, and extracts from other published work comes together to celebrate the Pearl of the Orient. The book will salvage the state’s history and complexity from its sun, sand, and surf image, but the vindication will only further reveal that there is much left to be resolved. Cozinha de Goa – Goans love their food. In this tiny region, East did meet West on the dining table. Goan cuisine comprises Christian, Hindu and Muslim-influenced food. It is an interesting fusion from several cultures — Arab, Portuguese, Brazilian, French, African, Chinese, Malaysian, British, Anglo-Indian and Konkan. This book offers an encyclopaedic vision of a cuisine with a global touch — how it was, how it is, and how it came to be. 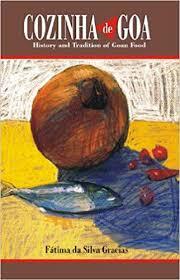 It is written by a veteran Goan historian who knows her food. 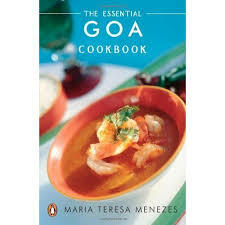 Essential Goa cookbook – Over two hundred recipes from one of the best coastal cuisines of India. The spicy, succulent seafood of Goa is as famous as the golden beaches and lush landscape of this premier tourist destination of India. Traditionally, the Goan staple was fish curry and rice but under Portuguese influence there developed a distinctive cuisine that combined the flavors of Indian and European cooking, with local ingredients being used to approximate the authentic Portuguese taste. So fish and meat pies were baked with slit green chilies, assado or roast was cooked with cinnamon and peppercorns, pao or bread was fermented with toddy, and the famous baked bol was made with coconut and semolina. This innovated, largely non-vegetarian cuisine was offset by the traditional and no less sumptuous vegetarian creations from the Konkan coastland, rich with coconut and spice. The Penguin Essential Cookbooks are a pioneering attempt to keep alive the art of traditional Indian cooking. Each of the books is written by an expert chef who brings together the special recipes of a region or community along with a detailed introduction that describes the rituals and customs related to the eating and serving of food. A delicious mix of Portuguese and Konkani flavors, rich with coconut and spice. This cookbook showcases an entire range of Goan food, with special attention to fish, prawn, pork and chicken. The recipes include: Bebinca Goa Fish Curry Mutton Xacuti Oyster Patties Prawn Balchao Sorpotel Stuffed Crab Tiger Prawns in Fen Vindaloo. 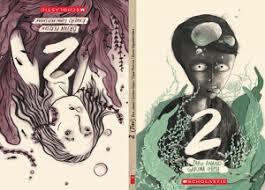 “Örjan and I were part of a venture, funded by the Swedish Institute, which brought together Indian and Swedish writers and illustrators to work collectively on book ideas. Most groups started their work quickly and opted for picture books. But Orjan and I didn’t want to do this. We were seeking an adventure. So, we went out on a boat to jog our imaginations. Far out in the sea, two dolphins leaped out of the water. We looked at each other and said, ‘Let’s write something about dolphins.’ We decided to base our book in Goa and that it would be for teens. Eat Dust was born out of personal anguish. Hartman de Souza saw a hill that he had struggled to climb in the 1990s literally disappear as mining operations ravaged it. As he followed the trail of the missing hill, De Souza was confronted with burnished orange deserts where once all was verdant. 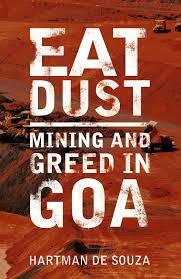 Enraged, he travelled the length and breadth of Goa, painstakingly documenting the operations of the state’s powerful mining mafia. At once travelogue, investigative journalism and family memoir, Eat Dust maps the culture, topography and cultural diversity of Goa. When the mining starts again, as it seems poised to, De Souza’s chronicles will stay behind like the taste of strong coffee, taken with less sugar to give it bit. 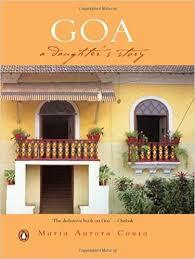 Goa: A Daughter’s Story, written by Maria Aurora Couto, is a novel about 450 years of Goa’s history. The novel describes how the state of Goa came into existence in the initial chapters, the author describes how various dynasties fought over the territory and how the Portuguese came to occupy Goa for 450 years. She sheds light on the religious, cultural and linguistic influences of the Marathas and the Portuguese, who ruled Goa for a time. This book tells the story of Maria Aurora Couto and her childhood in Portuguese – ruled Goa. As the young wife of a civil servant, she lived and taught in various parts of India . 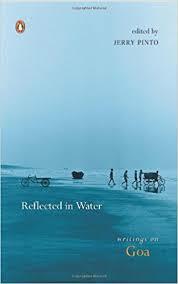 The author moved back to Goa in 1960, accompanying her husband, who was the first Administrator of the state of Goa. The novel throws light on the state of affairs post 1960, as Goa tried to assimilate itself with the rest of newly – independent India. On a deeply personal note, the author brings to light the history of religious persecution under the Portuguese and the forced conversions to Christianity . The author discusses the prevalence of the caste system among Goan Christians and questions its modern relevance. As the novel moves to modern Goa, the book discusses the impact of widespread corruption in public life. The author highlights the apathy and vested business interests which have led to the environmental degradation of this paradise. Are there any books on Goa that you’d like to add to this? Please let us know! Happy reading. And happier travelling!